Former Test captain Michael Clarke says he's not to blame for the ball-tampering saga and he's not willing to be linked to one of the most infamous scandals in Australian cricket. 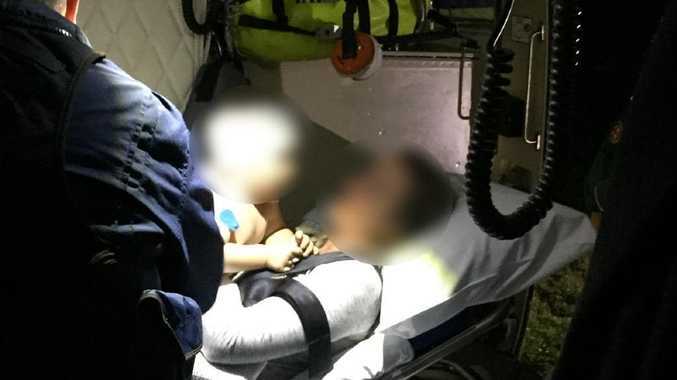 The morning after unloading a scathing social media attack directed at broadcaster Gerard Whateley, labelling him a "headline chasing coward", Clarke said he did so because he felt his integrity had been questioned. "I think what Gerard has said is completely out of line," Clarke said. "Trying to blame me for cheating in South Africa is an absolute disgrace. "I made my feelings very clear of what I thought of Gerard Whateley's comments. "I've been able to cop my fair share of criticism, whether it's been fair or unfair, I've copped it. "But when somebody questions or insults my integrity and my credibility, that's not for sale. "That's not on, so I made my feelings very clear on social media." When asked whether he wants an apology from Whateley, Clarke said: "I couldn't care less about Gerard Whateley". On Thursday night Clarke sent a tweet - directed at Whateley and his radio station - where he replied to comments made earlier in the day. He defended his impressive record as captain and the manner in which his teams played, before turning personal. "Fact: For Gerard Whateley to insinuate that I am responsible for the ball tampering issue makes him nothing more than a headline chasing coward," Clarke wrote. "If you think that the current No.1 team in the world in cricket right now puts being liked as of higher importance than being respected and playing to win inside the rules of our game than you're as delirious as you are ill informed." Clarke said blame for the ball-tampering episode lay squarely with banned trio Steve Smith, David Warner and Cameron Bancroft. "You can blame culture, you can blame chairman of the board, you can blame the CEO, at the end of the day three people made a decision that they have to live with for the rest of their life." The war of words between Clarke and Whateley, which has this week played out on rival sports radio stations, started when Clarke said Australia's current line-up needed to "stop worrying about being liked and start worrying about being respected." 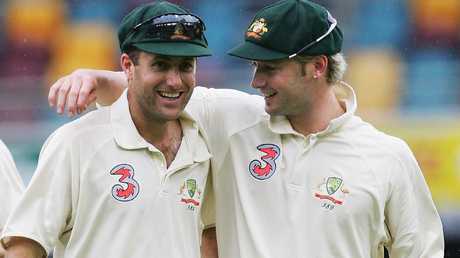 Whateley and former Test star Simon Katich, the latter famously once involved in dressing room altercation with Clarke during their playing days, were critical of the former captain's comments about the state of Australian cricket and declared he'd missed the point. But Clarke has stood by his view in the wake of the ball tampering scandal and subsequent scathing review into the culture at Cricket Australia. That review has led to a new era of cricket in Australia where a player's character will be taken into account as much as on-field talent when it comes to selecting teams for all forms of cricket. 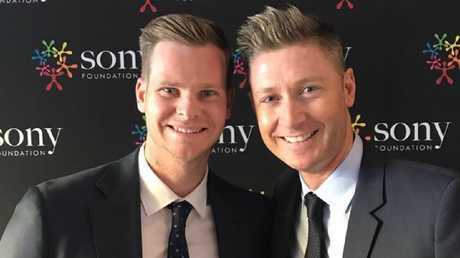 Former Australian captains Steve Smith and Michael Clarke. 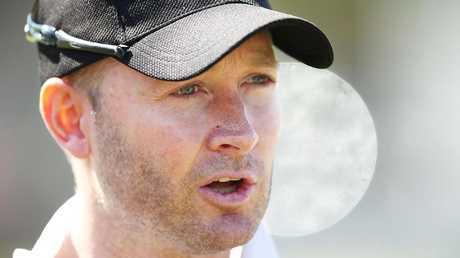 Clarke clarified what he meant by declaring the Australia team must continue to play tough, hard cricket. "We as cricketers call it 'the Australian way' and what it means is playing a style of cricket that is with good attitude, good intent, good aggressive body language but always playing within the rules," he told Macquarie Sports Radio. "I think that tough, aggressive, competitive, never take a backwards step does not mean cheating is fine, it does not mean taking sandpaper onto a cricket field is fine, it does not mean sledging and personal abuse is fine and that's where I feel some people might be misguided in interpreting what I'm saying. "I've never once in my life thought that stuff is fine." Whateley and Katich spoke out against Clarke's views, declaring he'd "missed the point" of the culture change inside the team. The broadcaster also declared the poor culture in Australian cricket, which led to the ball-tampering scandal, was born under Clarke's leadership. Whateley's opinion of Clarke and his leadership hasn't changed despite Clarke's scathing response. When asked whether he'd take back any of what he said on Wednesday, Whateley was emphatic on SEN: "No." "It's a firmly-held belief that his misunderstanding of what happened in Australian cricket over the past nine months, and being wedded to an old idea that has proved to be the destruction of the team and it dates back to his time as captain. "I never said that he was responsible for what happened in South Africa, but where Australia became a reviled cricket team, that dates back to his time as captain and it continued on from there. "My criticism of Michael Clarke was harsh and his reply was suitably severe. "If Australia regresses to playing cricket the way it was in recent times, using the fictional line as a flimsy alibi, then the fall of the team and the organisation will have been for nought. "Australia's quest is to indeed restore respect but without being reviled and that was the dissent that began under Clarke. "Mitch Johnson has written about the toxic culture that developed under Clarke's leadership and collapsed in the sense of team that left some not even wanting to play." 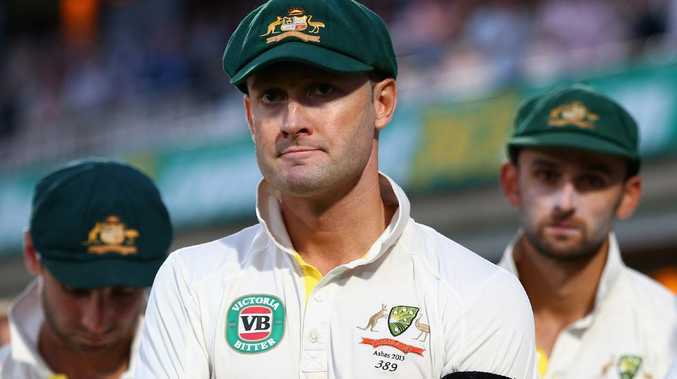 "Australian cricket I think needs to stop worrying about being liked and start worrying about being respected," Clarke told Macquarie Sports Radio. "Play tough, Australian cricket, because whether we like it or not, that is in our blood. "If you try and walk away from it, yeah we might be the most liked team in the world, we're not going to win s---, we won't win a game. All we can do is want to win." "Clarke's interpretation of the predicament the Australian men's Test team finds itself in is breathtaking. "That he would continue to rely on the line - the fiction his and subsequent teams used to excuse all manner of boorish behaviour - might be the single greatest piece of nonsense over the past nine months. "Once again we find someone missing the point," Katich told Whateley on SEN radio today. "What's been forgotten in this is we blatantly cheated and there's a reason we're at this point now. "We've spoken about wanting to get the Australian public's trust and make sure that clearly you want the Australian public and cricket fans to like or love the Australian Test team. Certainly there's that aspect, but from an opposition perspective we're not concerned about being liked one bit." "You don't play because you want to have a masters in being a good bloke. "I know what our truth is as Australian cricketers. We play our best cricket when you're fighting. Now the word 'fight' evokes fist fights, verbal diarrhoea and racial and religious taunts. It's nothing about that," Hayden said, as reported by Fairfax. "It's about a body language and it's about the fact that as Australians when you walk across that line and you play at the SCG, 'this is our country, our turf'. And on our watch we want to try and win. And I think that's really what Michael would be trying to say - that it's about that competitive edge." "For Gerard Whateley to insinuate that I am responsible for the ball tampering issue makes him nothing more than a headline chasing coward," Clarke wrote.